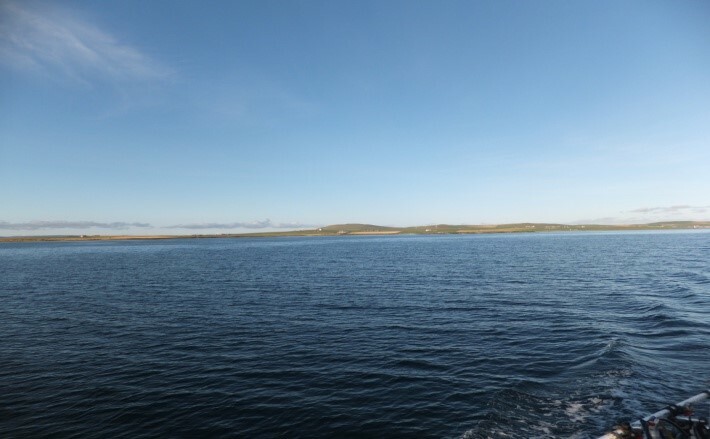 Our expedition to Shetland – Fair Isle – Orkney, has become a shortened ferry crossing to Kirkwall in Orkney only, due to the predicted high winds and no diving in Shetland. Our intrepid leader, Richard managed to get us a refund on the ferry and organise taxis waiting at Kirkwall at 11.00 pm on a Saturday night (fortunately given the extreme distance between ferry terminal and harbour). 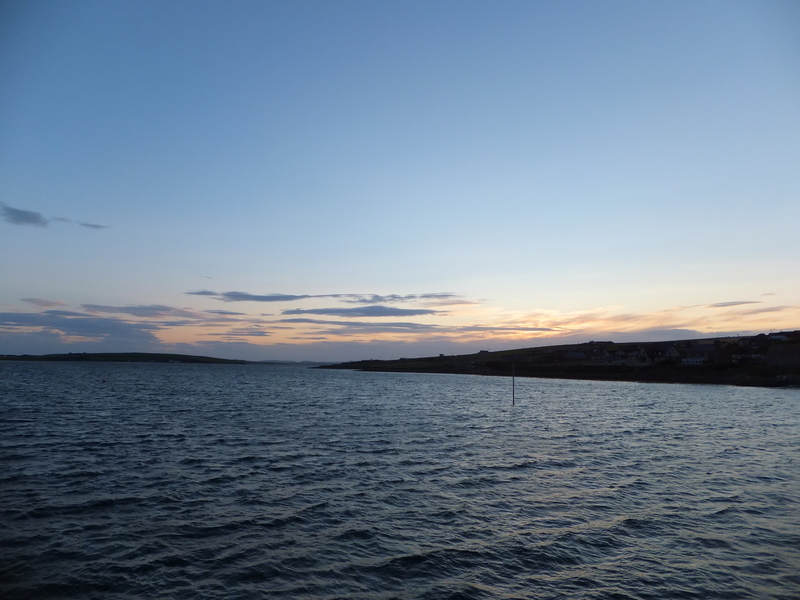 There was no sign of the poor weather as we set out for Kirkwall on the ferry enjoying a beautiful sail and sunset. Given the late change of plans and Bob’s steam down from Shetland on Friday night / Sat am the diving plans were up in the air. Then there was the midnight kit load and set up. 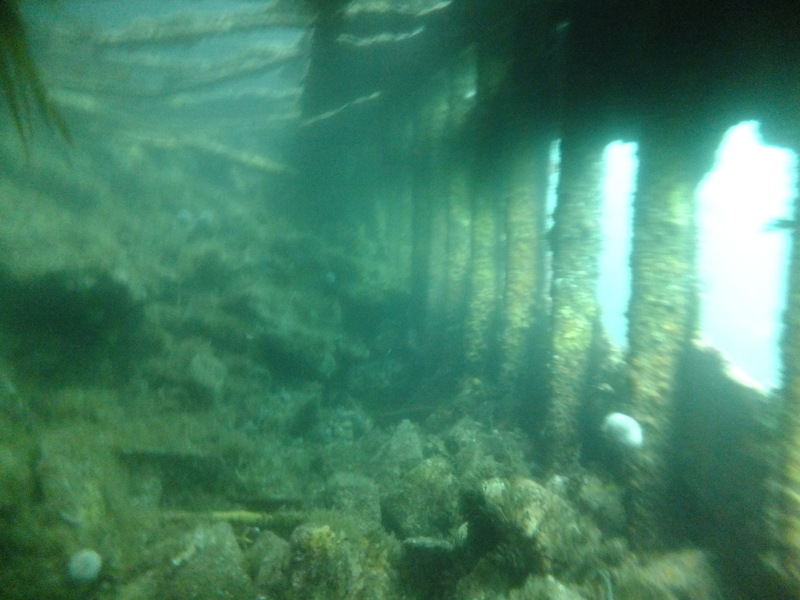 A late first dive next day became a scenic one against a rocky wall. Plenty of big gullies and 3 octopus spotted hiding in the rocky holes. 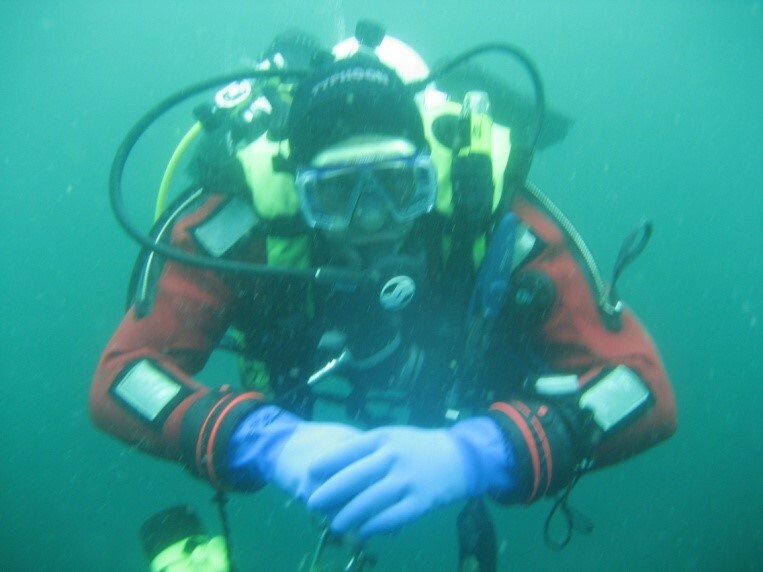 A nice shakedown, given many of the group had not done much diving – July St Abbs having been cancelled due to bad weather. Great reviving lunch of leek and potato plus blue cheese soup given the swimming against the current which was running reasonable strongly. Wreck of the Cotavia, 2nd up late in the afternoon. Deep but great viz with huge boilers and a plate stood upright against the block. Lots of life but just not enough time. On the surface some of us had to swim hard back to the boat. Our DO, Matt, opted to take to his bed due to the excessive exercise at his advance age ! A long and slightly lumpy steam round the islands to get into the relative shelter of the flow at Lyness at 10.00 pm. A quiet night with everybody up and at it for the 9.00am appointment with the Koln. 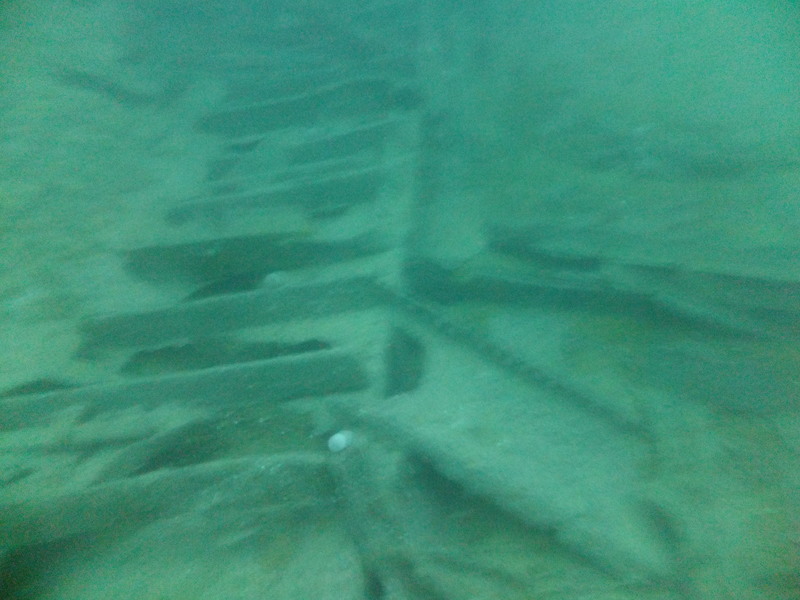 36m to the bottom, lying on it’s starboard side relatively intact for the cruisers. Most opted for the bow excursion. A delicious lunch of sweet potato soup with a suitable digestion interval led to 2.00pm at the Brummer. Slightly better viz but the lighter built ship has ‘dropped’ more that her cousin. Several saw two seals both from the wreck and the shot line. Diane tried knitting with lion’s mane tendrils on the shot line as it appeared out of the mass of bubbles from the mass of divers on the shot line. Richard and Frankie were nothing like as creative and were merely stung. It being Frankie’s birthday we were treated to an impromptu cake and candles for dessert after the delicious pork and cider casserole. Frankie did manage to blow out all 44 candles and wished to go to the pub in Stromness. It did come true !! A fine morning and off to the Dresden. A little more canted over and top plates dropping but still enjoyable with features and guns a little clearer. Lots of shoaling fish and a few more lion’s manes near the shot. 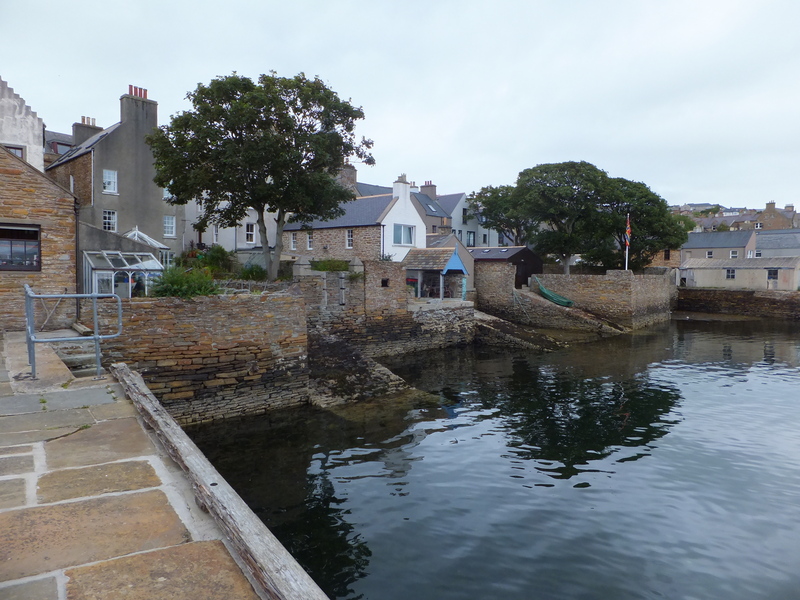 Into Lyness (Hoy) for a little walk to the naval cemetery and tea (best china for a change) and scones at the museum. A short trip over to the F2 and Barge. 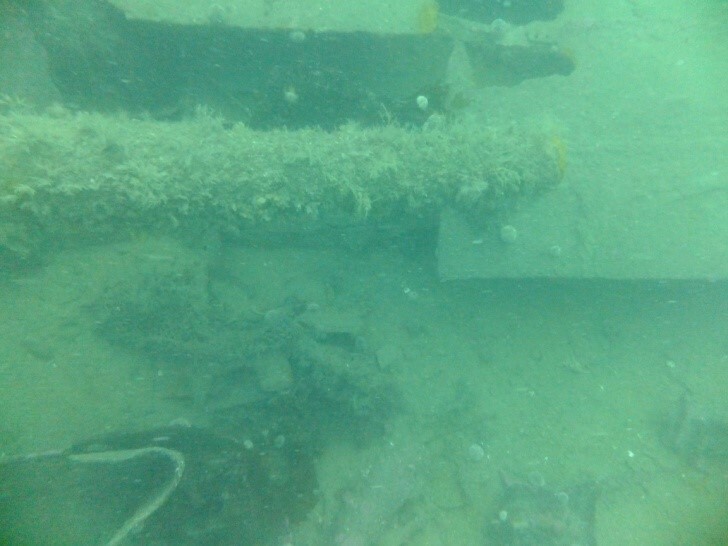 F2 bow section mostly there but midships and stern salvaged / spread over sea bed. 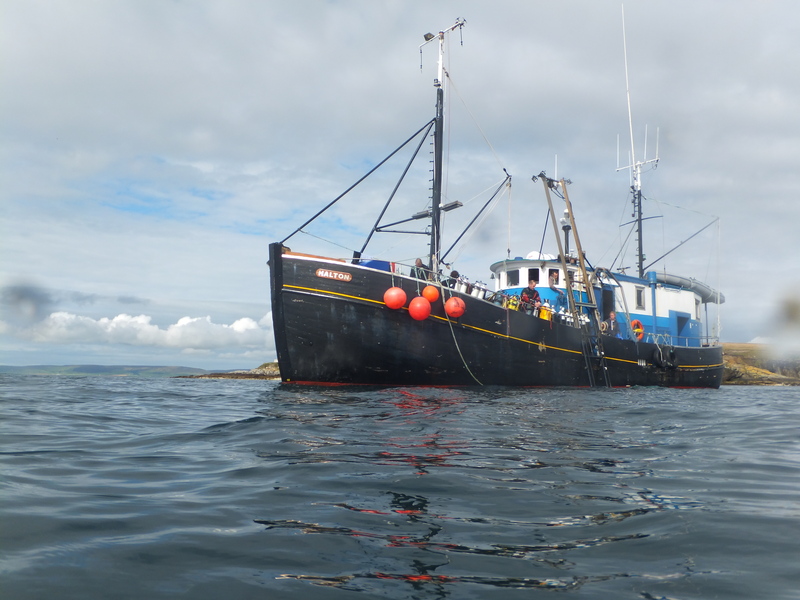 Lots of fish life especially wrasse of all types, followed line to Barge with salvaged gun and vice(s) and then back. A liesurely 60 minutes with no bottom time concerns (18m). The evening found us docked at Burray next to Andy’s boat, the Jean Elaine. A brisk walk after dinner to the other side of the barrier (beach beyond dunes) cleared the cobwebs and got us ready for a pint in the hotel bar. The imbibing continued back in the rum bar (the boat saloon). UB116, a late German casualty of the first war, is well blown apart at 29m. The central body has recognisable shapes and features but is quite distorted in some areas. 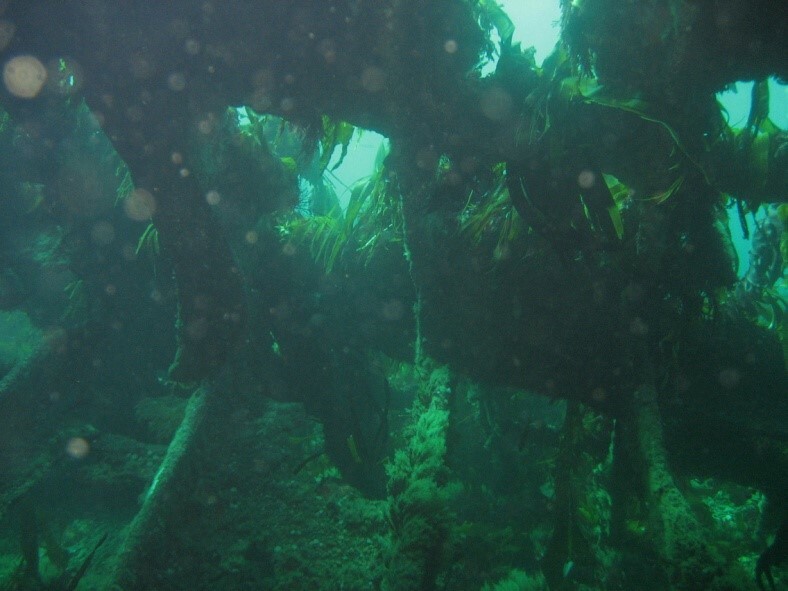 Only one pair found the remains of the conning tower (from the briefing off at 45 degrees). Alex and Will did a defined search pattern to locate it. Only problem for Alex, given Bob’s briefing about it looking like the sub from the ‘Yellow Submarine’, was the song (Beatles – only for those of a certain age !) repeating over and over in her head. There were conger, ling and octopus as well as shoals of small fish. 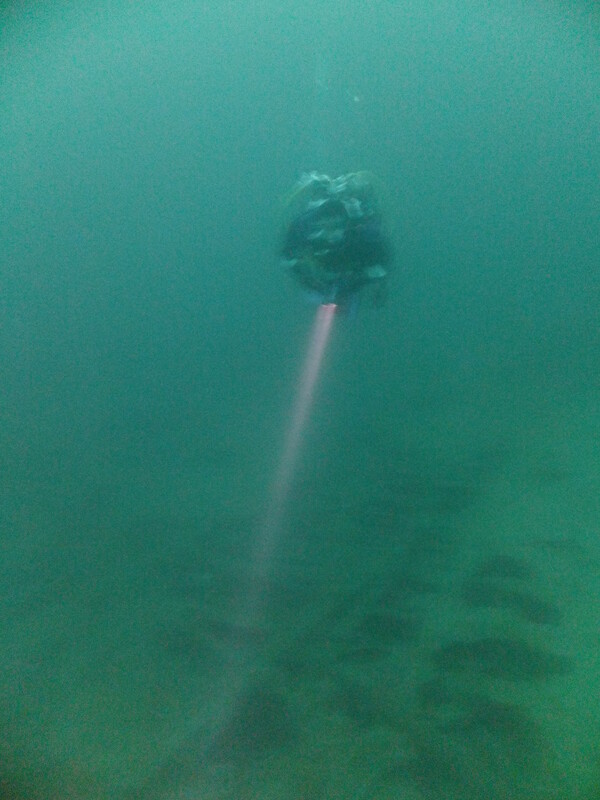 On a very white sandy bottom it felt very bright with good vis before divers feet stirred it up a little. Everyone enjoyed this one, so good even Syd did 10 minutes deco. Adventure was on the agenda for the afternoon. A drift down Burra Sound over the block ships. Turned out to be quite gentle on the Skye scale. Only 3 pairs were separated but that may have been deliberate. There were certainly fast and slow pockets, as well as the occasional lumps of metal. 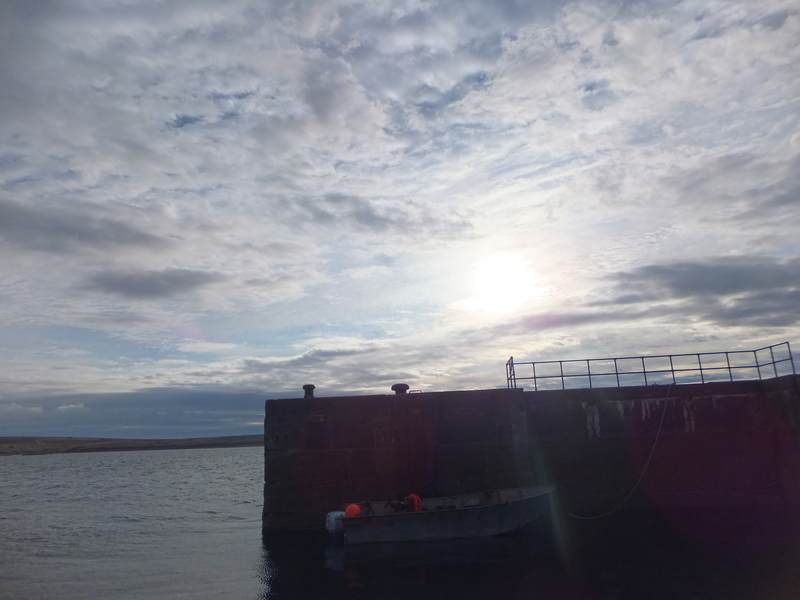 Continuing the theme, after docking at Lyness and reviewing the new museum exhibits, a walk up to Wee Fea. 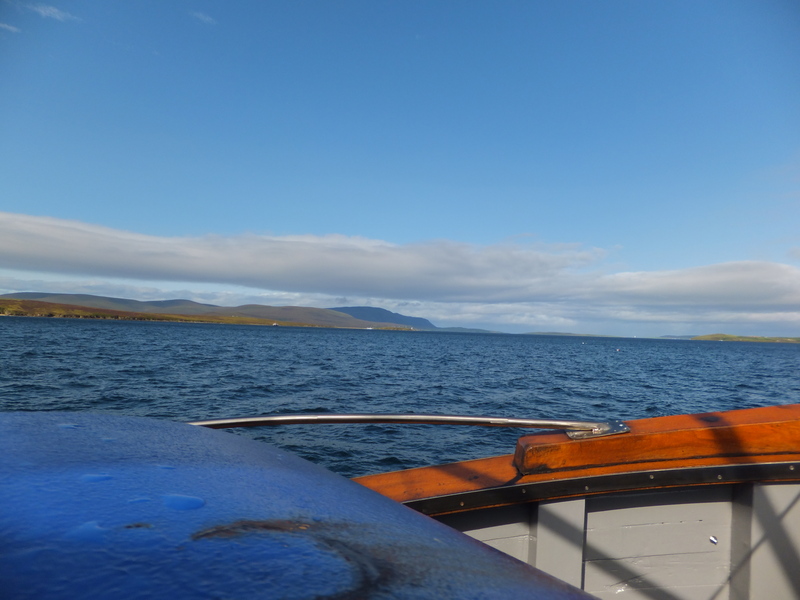 A thorough exploration of the observation block gave outstanding views over the whole of Scapa Flow. There is an Anchor bar with entry hidden at the back of the hotel block that we persevered and located. Another bright and still morning dawned for an earlyish start. Horrors !!!!! The midges appeared in the calm. Everyone hid indoors until the boat got underway. 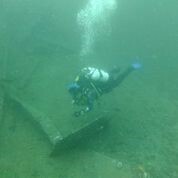 Kronprinz Wilhelm, the shallowest of the battleships was our next dive. 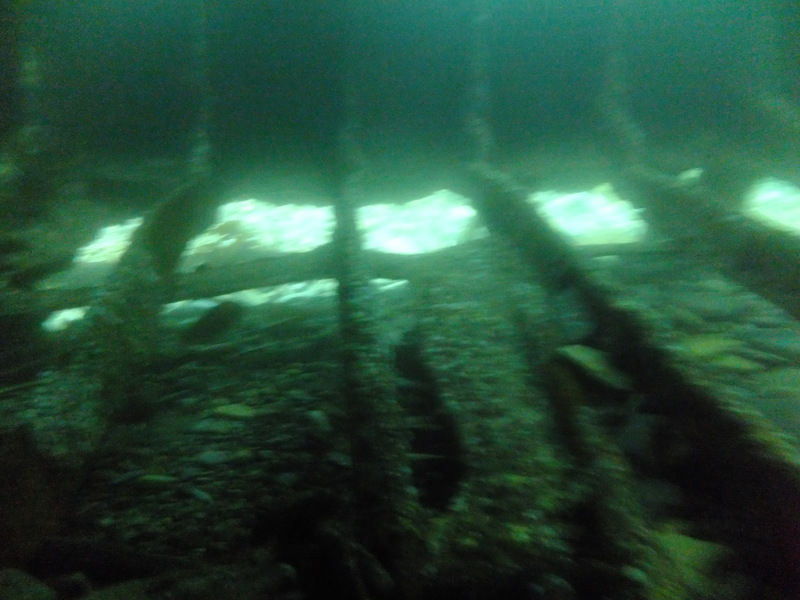 Quite dark underneath, boat is turned turtle, but lots of life on the bottom (top). Highlight of the week for some – Tabarka. 12.00 for the tides. It has deteriorated from previous years. The gap in the middle is much bigger, the clearances have reduced with the plates dropping. On the plus side, we were on super slack, so we could explore round as well as inside. The light streaming through the holes still makes this spectacular. 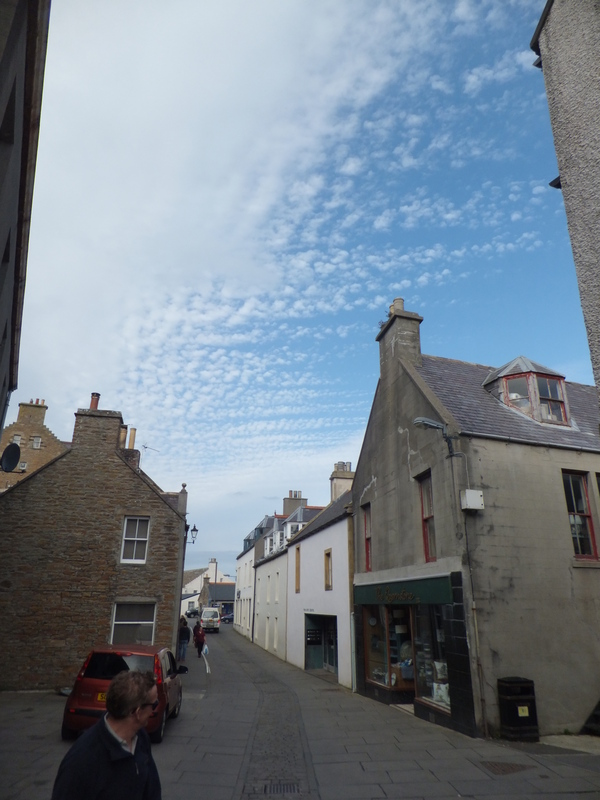 So an afternoon and evening in Stromness. A nice walk round the town, then up the hill, a pre-dinner drink, tea and then a fiddle group to entertain us in the Ferry Inn. This morning Hannah educated us on nautical matters as the ‘boutique’ cruise ship (ugly cattle) docked beside the Halton. Derricks not cranes. Posh is teak not steel caps. Off to the Dresden again with Bob putting in the shot that should be on the stern (deep entry, shallow exit). Steve demonstrating superb leadership skills by getting Karl to lift the weight onto the deck, so he could tie it in. Oh no. Our final dive. The Karlsruhe. 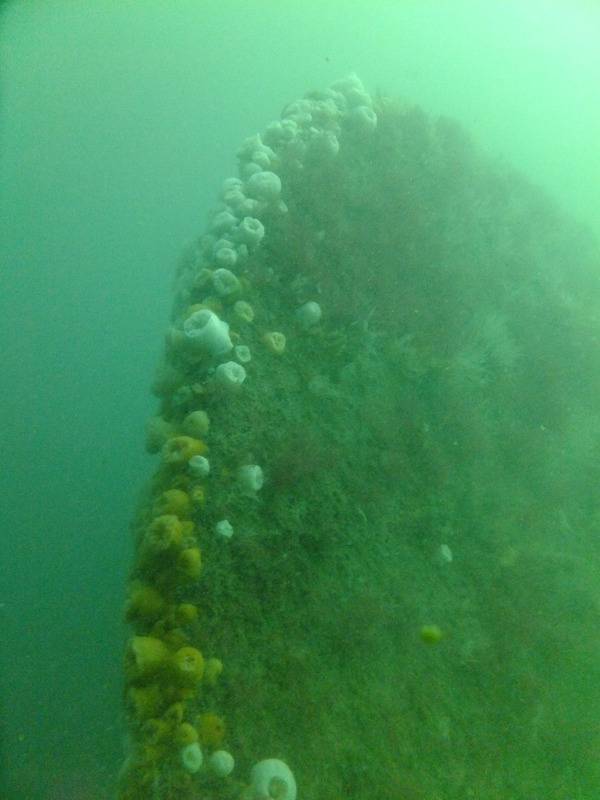 Much more distressed than the other cruisers but more ‘accessible’ and at a more convenient depth (25m). 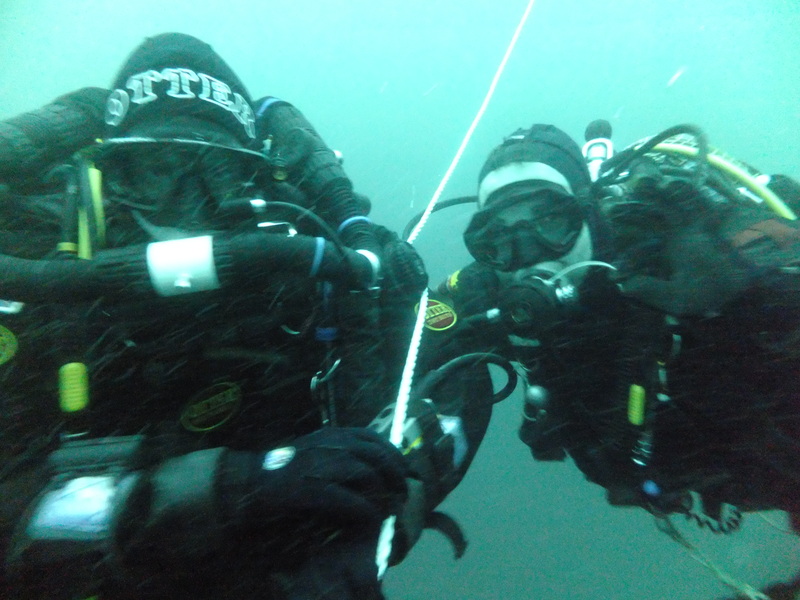 A lovely dive to finish with lots of identifiable metal and life. 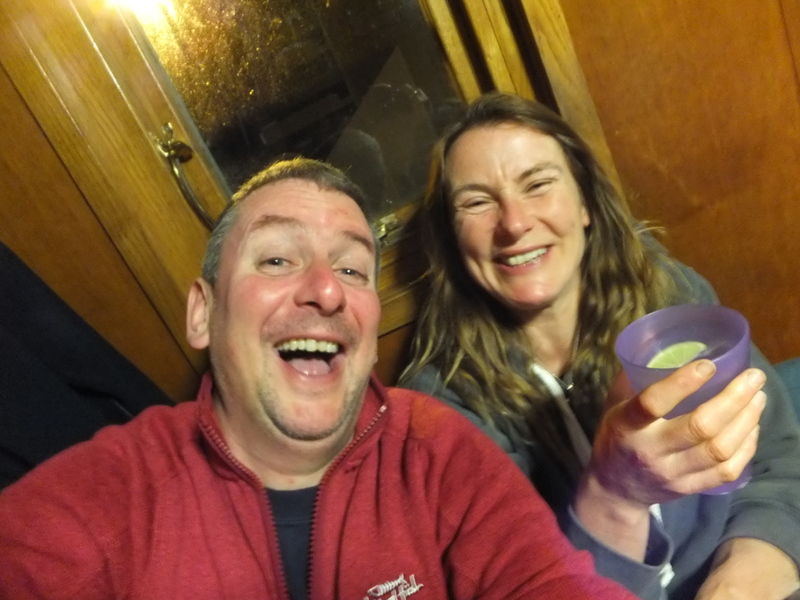 So we said our goodbyes to ‘5*’ Fiona and Hannah ‘banana’, our fantastic crew for the week, and to Bob, a truly great skipper and diver. 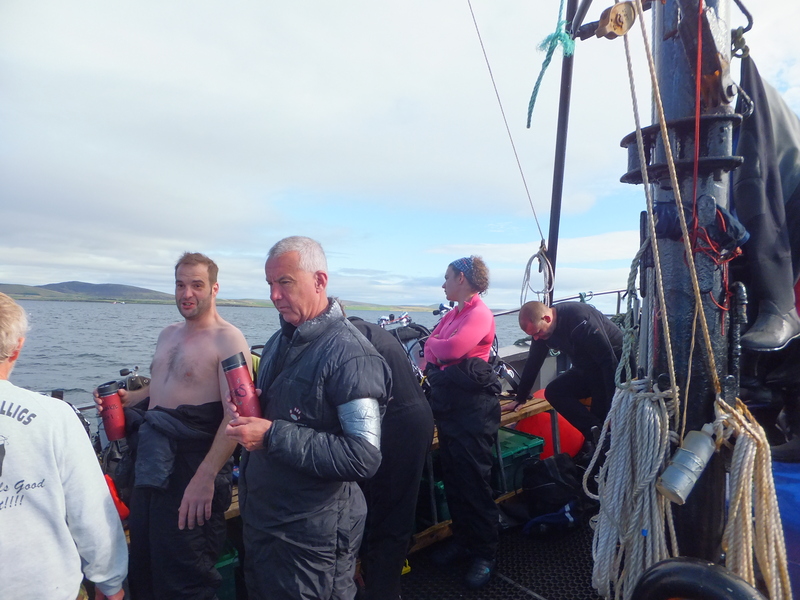 Reorganising the dive plan after being blown out from Shetland and giving us the type of diving we were looking for in the best possible conditions each time. And finally thank you to Richard for organising it all. A little frustrating at times I know. 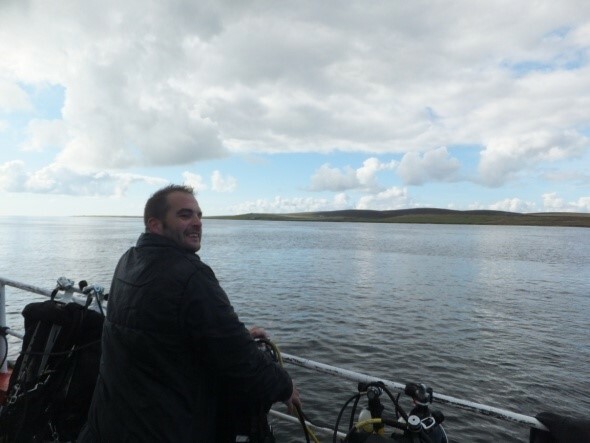 Huddersfield BSAC 18 – The mysteries of Orkney. 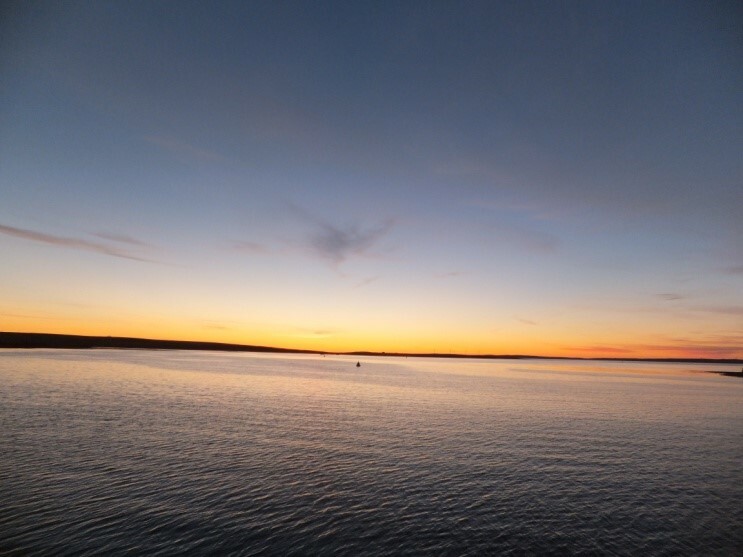 The Orkneys have been inhabited for 8,500 years from the Neolithic to the present day. 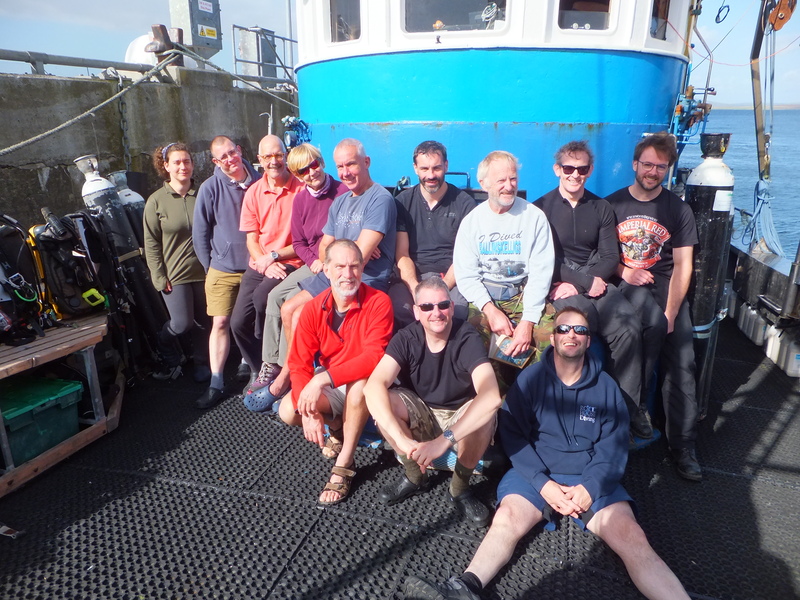 They have witnessed major historical events – Viking invasions, scuttling of the German fleet in World War I, the base for dangerous Arctic convoys of World War II and most recently the invasion of these mystical islands by Huddersfield BSAC 18. In early centuries, the locals worshipped the sun and the moon and mystery and magic abounded. Some say that mysticism still pervades the islands and some of the events of the club’s trip had all the hallmarks of these mysterious influences. How would you account for the beauty of the weather – well most of it? The intensities of the sunsets, the tranquillity of the sunrises, for those not sleeping off late nights tying knots and talking. 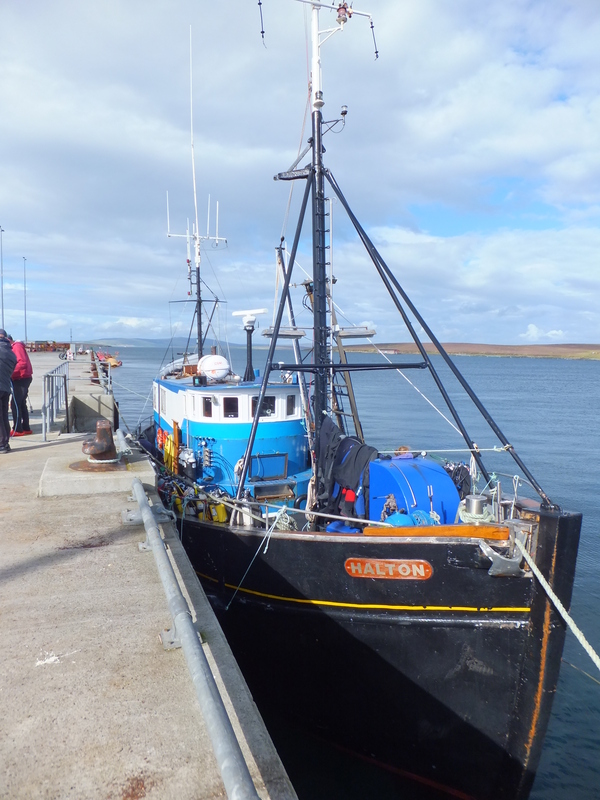 How would you account for the calmness of the seas which enabled the creaking Jean Elaine out of the flow and north to the Northern Isles for the first time this season and allowed those of us with delicate stomach to shun the call of the ‘Stugeron’? How would you account for the stunning visibility in the Flow? 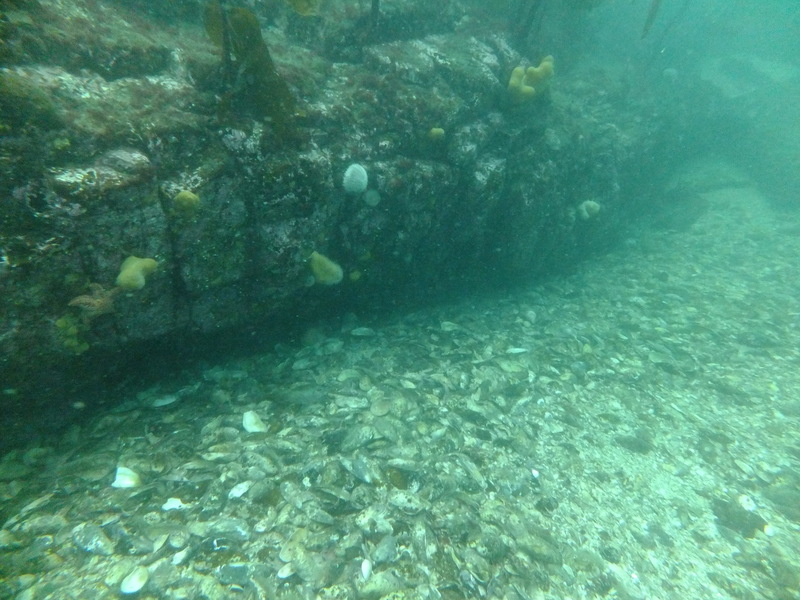 It was actually possible to see a lot, if not all, of the gargantuan German warships rotting away on the seabed. Including large tubes which mystified your author and excited our glorious leader. So there were a couple of big guns under the Kron Prinz Wilhelm………….!!! Seen one gun, seen them all. Now that’s good viz. How would you account for the temporary disappearance of Frankie on a drift between Eday and the Calf of Eday for a goof half an hour? Some of the company were mysteriously humming the tune to ‘Frankie goes to Holywood’ while scanning the waves. Full marks must go to Karl’s eagle eyes for spotting the forlorn diver and his orange blobby. He’s out there somewhere. Lost? Who was lost? How would you account for the strange temporal, or was it cerebral, imbalance that resulted in Richard H and Alex spending 25 minutes in deco returning from the Kron Prinz Wilhelm? Perhaps they were sucked into a marine black hole which transported them to a wreck on another astral plane…………..apologies, I’m getting carried away. 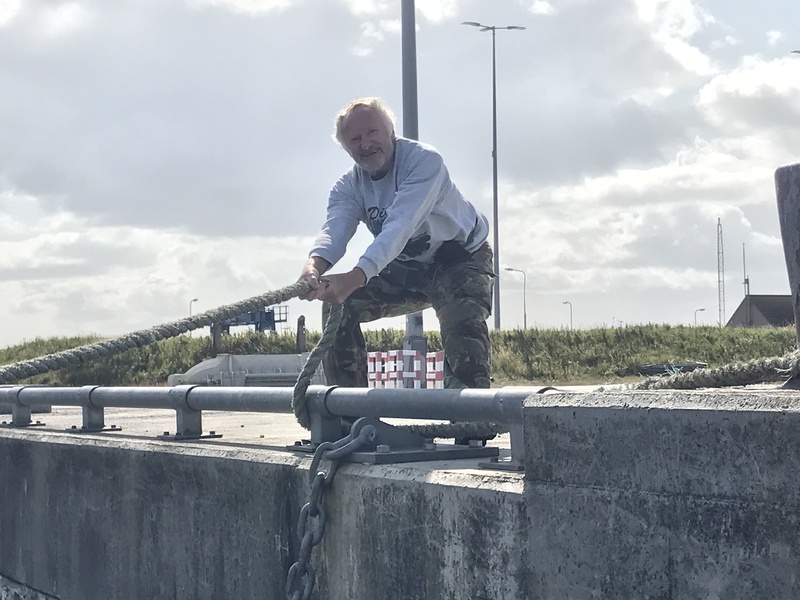 How would you account for Richard W finally remembering his ‘Book of Knots’, buying 1m of cord in Stromness to enable hours of innocent fun on the part of some of the Company and the suddenly discovered need for sleep, on deck, on the part of the rest? Retreating from knots and Rhys. How would account for the outpouring of the huge lexicon which is Rhys Farrow’s verbal encyclopaedia (this is his type of phrase)? This avalanche of verbosity delighted some of the Company and rendered others to a state of distracted desperation. It has become apparent since this trip, that the mysticism of Rhy’s verbal manifestations are a constant and not just attributable to the strange influence of the Orkneys. How would you account the presence of an aggressive man-eating scallop which nearly surgically removed Frankie’s finger? A scallop, with many others which became part of a mystical fish pie created by our oft referred to leader, Richard W. The same fish pie which contained the only mackerel the company managed to catch from a sea full of Mackerel. 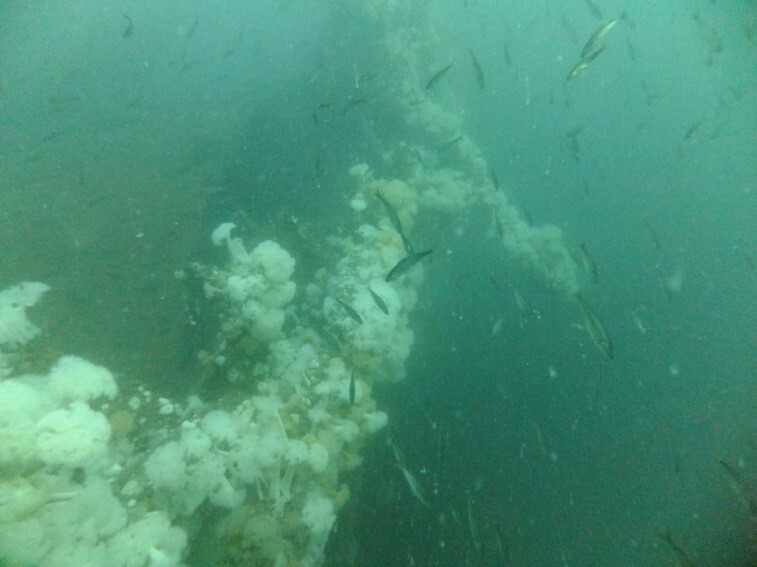 How would account for the masses of fish which seemed to appear on every wreck we visited? They were present in such quantity that the expressions ’fish blizzard’ and ‘fish soup’ were coined in description. 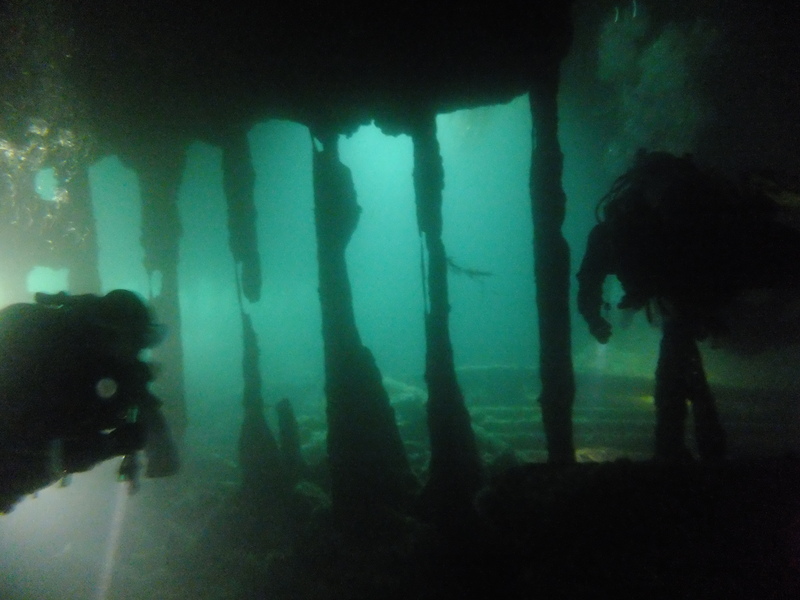 How would you account for the fact that Will and Richard H and Alex reached the milestones of 150th and 100th dives respectively on this particular tip in this particular place? 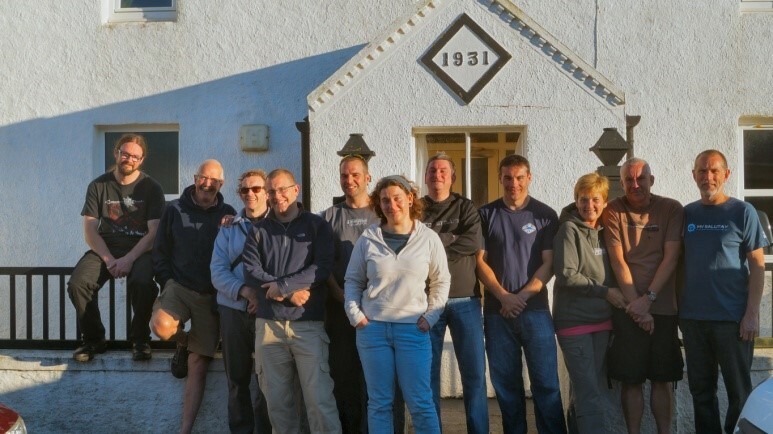 How would you account that, out of a potential collective 144 dives for the trip, 144 dives were completed despite some of the company suffering from colds and doubtful eustachian tubes? This was a statistic which had never before figured in our chief statistician’s (Steve H) copious records before. How would you account for the sheer divine food which Diane, Frankie and Richard W conjured up out of a ’new’ yet very recalcitrant cooker? Perhaps the state of near starvation of the awaiting company transported them into gastronomic nirvana when the food finally arrived. Or perhaps just top drawer cooking. 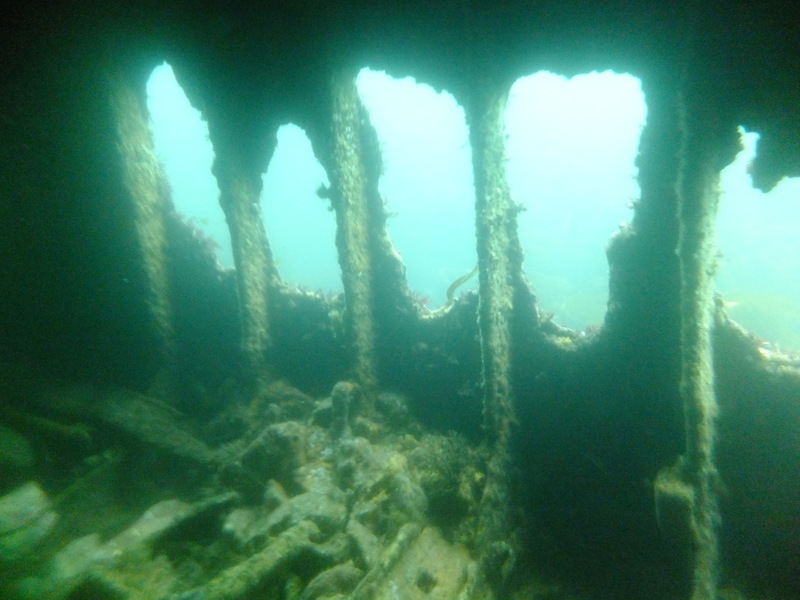 How would account for the weird spectacle of the Tormalina wedged upright in its own rocky gully looking as if the crew had only just left – well apart from the rust, abundant marine life adhering to the metal and the holes and dents in the hull? How would you account for the almost spiritual experience that is diving the Tabarka? Sun streaming in the holes in the upturned hull, gin clear water and an abundance a marine life on every surface and in every nook and cranny. If one was inclined to the religious then the cathedral like space could bring you to your knees in supplication. Your overawed author needed to just sit and wonder at the sheer beauty of it all. The sceptics amongst you will dismiss all this mysticism as pure baloney. 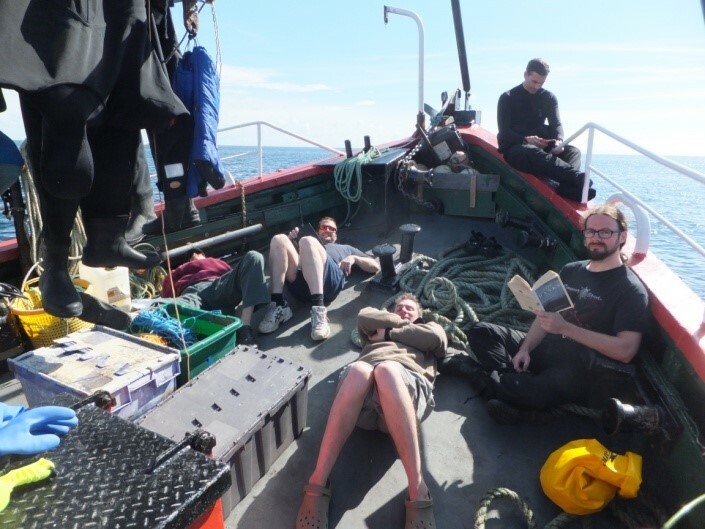 You would say it is all perfectly explicable combinations of benevolent climate and marine conditions, exceptional diving skills – well mostly, great seamanship, extraordinary group management and organisation and extreme patience of the verbose by the taciturn. Perhaps, however there are forces abroad which are undefinable, that do not follow the logical or scientific path and which shape events and outcomes. Should forces be at work then, surely, the Orkneys must be a credible centre for their influences. Dear reader, I will leave you to decide……………………..